“1981 Extended Play” is the debut EP from alternative/indie duo, I Don’t Know How But They Found Me. The 6 track EP was released on November 9th, 2018 under Fearless Records. The duo consists of frontman and bassist Dallon Weekes, the former touring bassist of Panic! At The Disco, and drummer Ryan Seaman, the former drummer of rock band Falling in Reverse. 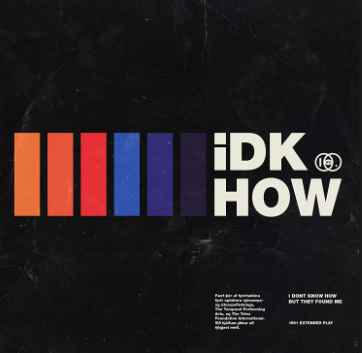 The band is often abbreviated as IDKHOW, as seen on the cover of the EP. IDKHOW first came onto the scene in the summer of 2017, making a cryptic instagram post under the new band account on July 11th, and releasing their first single on August 28th. Since then, they have released a number of singles and one EP, building a strong fanbase. The EP starts with “Introduction”, a 32 second commentary-style track that establishes a premise for the rest of the EP. It then transitions to “Choke”, a song with a mellow, almost happy, upbeat feel that distracts from the cynical, dark lyrics, with Weekes singing lines such as, “And what a lovely time/ That it would surely be/ So bite your tongue/ And choke yourself to sleep”. This song was the second single to be officially released by the band. Following “Choke” is a synthy song that will take you back to the 80s. “Social Climb” is a song that tells of people who use their association with celebrities to heighten and improve their own careers. The minor-leaning synth resembles that of the 70s and 80s. Simple beats and casual high notes add to the overall feel of the song, leaving you wanting more. After “Social Climb” comes “Bleed Magic”. This pop-feeling song will have you clapping along. This song uses a magical-esque sound effect, calling back to “Introduction”, where the same effect is used to inform the listener that they should “turn the page” when heard. With the simplistic drum beats by Seaman and catchy vocals from Weekes, “Bleed Magic” is dancey and is sure to have you moving. Next on the tracklist is “Absinthe”, which quickly became a fan-favorite, alongside “Social Climb”. This drum heavy track is riddled with wordplay, including the lyric “‘Cause absinthe makes the heart/ Grow fonder” which, according to Genius, is a pun on the phrase “Absence makes the heart grow fonder.” Out of all the songs on the EP, this song is the one that I would recommend the most. It’s clever lyricism and flashy instrumentals make it a truly enjoyable listen. The very last song on the EP is “Do It All The Time”. In one of Weekes’ many Twitter Q&As, he responded to a question asking the inspiration behind this song, citing it to “Brainless corporate pop music. And the ‘do whatever you want’ philosophy. I wanted to make fun [of] them. So I did.” This is very prevalent in the song, with the first verse reading “We're taking over the world/ One kiss at a time/ And then I'm taking your girl/ And I'm making her mine” This song provides a feel-good vibe and is worth listening to. Overall, “1981 Extended Play” is an amazing EP filled with enjoyable tracks, all of which I would recommend.